There is a greater challenge than dumping a bucket of ice over your head – are you up for it? A few weeks ago, you couldn’t get away from it no matter how hard you tried. Friends, family and celebrities were getting in on the viral publicity stunt known as the ALS Ice Bucket Challenge. It was on the news and it was in your news feeds on every social media outlet you frequent. But this isn’t just a rant about that viral maelstrom, so bear with me. The ALS Association notes on its website that since July 29, they have received $115 million in donations, mostly due to the publicity of the viral video challenges and responses. That’s great, but one of the things I found frustrating about the Ice Bucket Challenge was how many times I saw people doing the challenge and challenging others, but not really connecting with the reason for it. I saw many videos where ALS wasn’t even included in the video or posting — just Ice Bucket Challenge, as if buckets of ice water had become the new fraternity initiation tool. Too many people didn’t know why they were dumping ice water on their heads or what ALS is really all about. It all sounds very clinical and I wouldn’t expect people to have cited all of the details in their videos. But I would have liked people to remember more about why they took the challenge. They needed to remember the people and the families affected by this horrific disease. They needed, for once, to not let a viral video be just another flash in the pan. They needed to think about what they can do to help with ALS patients and families now and in the future. 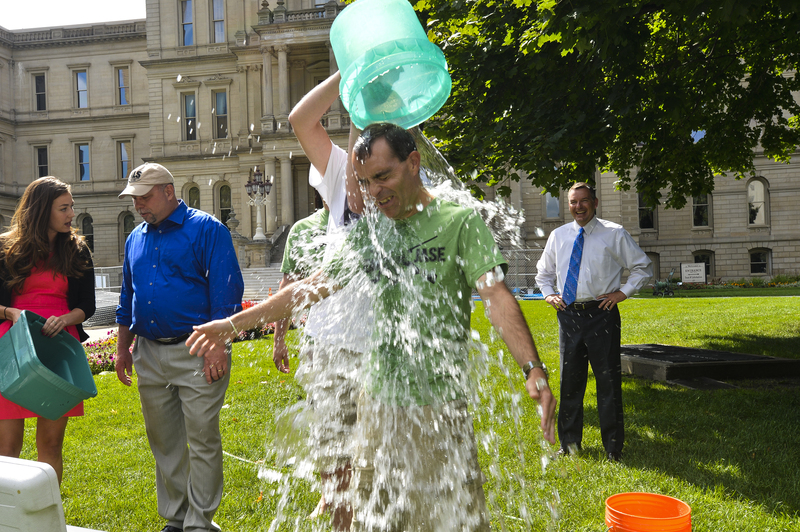 I participated in the ALS Ice Bucket Challenge along with a number of coworkers and colleagues. I made it a priority for us to produce a video at work that did more than just showing legislators and employees getting ice dumped over us, although I’m sure that made some people happy just on its own. We talked about why we were doing the challenge, what the disease involves and encouraged people to stay connected with the cause well into the future. For us, it was personal. Our chief of staff at the Michigan House of Representatives is Norm Saari. His son, Eric, was our inspiration as he was battling ALS and we wanted to do what we could to honor his challenge in life with our challenge to raise funds and awareness. We did well, raising more than $5,000 with our efforts. I can only hope we raised awareness, as well, which is part of the reason I’m doing this blog post, too. As I wrote earlier, this isn’t just a rant. Sure, there are plenty of things I could write about what happened with this campaign from a public relations perspective or as a review of social media activities for fundraising. But, instead, I’m writing this to urge you to find out more about ALS. To keep folks like the Saari family in mind. And as a tribute to Eric Saari. Because Eric died on Sept 18. I never met him and now I never will. But I will always remember him. Not because he was the reason I had a bucket of ice water dumped over my head to become part of a viral video sensation. But because any time someone asks me to give to a disease-fighting cause, I will be thinking less about the disease and the tax write-off and a lot more about the affected people and their families. So, thank you, Eric, for showing me something I never realized I needed to see. Rest in peace; challenge accepted.